Sucuraj is a town by the sea, situated by a deep bay and in a valley facing the sea. It is at the point where the island of Hvar comes nearest to the mainland. 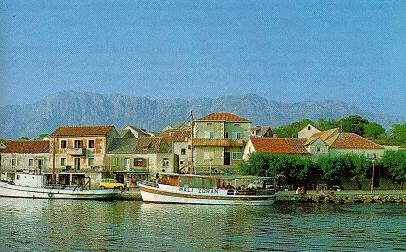 The distance between Sucuraj and Drvenik on the mainland is only 6 kilometres. From Sucuraj there is a wide panorama of Biokovo, Makarska and Peljesac. The town was built on two small peninsulas with a harbour, in the 15th century. From ancient times this position has had an important strategical character, as well as a role in communications with the mainland. Therefore, the continuity of cultures dating from Illyrian times is easily understood. The Hvar Statute of 1331 mentions the church of Sv. Juraj (St. George) in Sucuraj, which is where Sucuraj gets its name from. However, this does not mean that there was already a bigger settlement there, apart from some shepherds' or fisherman's dwellings. The settlement of the place was conditioned by the arrival of the Augustinians from Zaostrog who formed their monastery in the 16th century and took over the parish duties. The monastery was reconstructed in the 17th century, and now only parts are preserved, mainly the perimeter walls and a large number of architectural fragments. The residential architecture of the town, even today, has a certain influence from the Neretva style of building, more then any other place on the island. The houses are rustic, closed to the street but open out in the rear and are connected on the courtyard side by a series of arches. This type of building shows the defensive character of the town. During Venetian rule Sucuraj was at the point where three borders met; the Venetian, the Turkish and that of the state of Dubrovnik. In the 17th century the Venetians built a fortress which was unfortuntely bombed in the war as were a large number of houses. The town council building and the archive were bombed on the day the German troops withdrew from the island. The parish church of Sv. Juraj (St. George) is of later date and does not have the characteristics of a monument. It was built where the old one, which is mentioned by the Statute, stood. The baroque church of Sv. Ante (St. Anthony) was built by Franciscans from Zaostrog. It has a distaff-styled baroque bell tower. The church has an archaeological collection of Sucuraj. The town of Sucuraj is directly oriented towards fishing, fish preconditioned the direction of the economy towards fishing, fish processing, and later navigation. The population is also occupied with agriculture, wine-growing, olive and fig growing. The high quality dried figs are well known. Sucuraj has a series of picturesque coves on the north and south side. Some of them are under protection as places of natural beauty - e.g. the cove of Mlaska where there is a camp-site with facilities for cars. Its close proximity to the mainland has always made it not only a place for the arrival of new settlers, but also for very frequent attacks from there, especially by the Turks. This was the place where the people from Neretva settled and spread all over the island. Today, there are frequent boat connections with the mainland, so there is a constant to-ing and fro-ing of ferries. Traffic goes on by road towards all the places on the island and to the mainland, and this has conditioned the development of the town of Sucuraj as the transit centre of the island and made possible the development of the tourism as a subsidiary branch of the economy.